Now you'll remove some spot color where it overlaps the grayscale area of a second layer of the image. Notice that the spot color of the framework overlaps part of the Hammers layer. You'll remove this overlap by making a new selection and cutting it from the spot-color channel. 2 If guides do not appear over the image, choose View > Show > Guides. 3 Select the rectangular marquee tool ( ,), and drag a selection from the top left edge of the image to the right horizontal guide and top vertical guide. Normal should be chosen for Style in the Marquee tool options bar. 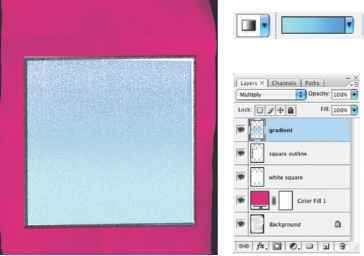 4 Make sure that the spot-color channel in the Channels palette is still active, and press Delete to remove the rectangular selection from the channel. In the image window, the spot color disappears from the hammers image. 5 Choose Select > Deselect. 6 Choose File > Save.